I would like to replace 3 large ChinaBerry & 3 large Chinese Tallow trees in my good sized back yard with some local wildlife friendly trees native to the Deltona area(first area.) What do you recommend? Good for you! Those are both non-native invasive plants, two characteristics that neither the Lady Bird Johnson Wildflower nor Mr. Smarty Plants likes. We will get to some suggested replacements in a minute, but first let's talk about getting rid of the present bad boys. Just cutting down these trees does not make them go away-they have been spreading seedlings far and wide and sprouts are probably coming up all over your neighborhood and beyond. To begin with Melia azedarach, Chinese tallow. 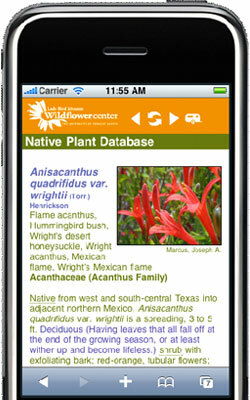 This link takes you to the Texas Invasives.org Invasives Database. Texas Invasives is a partnership in which the Lady Bird Johnson Wildflower Center is actively involved. Another website, the Plant Conservations Alliance's Alien Plant Working Group LEAST WANTED on Melia azedarach, native from southern Asia to northern Australia, gives basically the same instructions for elimination, but with more detail. Again from Texas Invasives.org, here is an article on Triadica sebifera, Chinaberry, which is native to eastern China, Taiwan and Japan. And from Invasives.org, some links to control of this plant specifically for Florida. We also suggest you consider having the stumps ground out, as new plants can sprout from those. Our suggestion is, get rid of the non-native invasives first, or as much as you can, before you plant your new trees. In fact, in warmer areas like Florida and Texas, December and January are better times to plant trees. We realize it just turned February, so if you can afford professional help removing the old trees and preparing the holes for the new trees quickly, it would probably be fine. If you are doing the work yourself give yourself some time. We are going to list some trees native to your area of Florida that we think will work out well, and some instructions for preparing the holes and getting those trees properly planted. Trees can be the most valuable part of your landscape and planting them is not necessarily an easy, do-it-yourself job. In order to select appropriate trees, we are going to go to our Native Plant Database and, using the Combination Search, select on "tree" for General Appearance and Florida for state. In the process, you can select for desired height, evergreen or deciduous, bloom time, light requirements, etc. Usually we recommend you look at all the suggestions we make, and then follow the plant link to each to see what growing requirements and qualities it has, and then make your selection. There are a lot of trees that will grow in Florida and we have selected only those native to Volusia County, because of soil and rainfall differences in different parts of the state. We found these by going to the bottom of our webpage for each plant and clicking, under ADDITIONAL RESOURCES, on "Find (plant name) in USDA Plants." For instance, here is the USDA page on Carya alba (Mockernut hickory). If the state you are in is green, that means that plant is native to that state, or at least that it grows there. Click on the green state (Florida, in this case) and you will get a map of the counties in that state where that plant will grow. Volusia County, on the central eastern coast of Florida is green. In that same ADDITIONAL RESOURCES area you can also click for a Google search. When you are doing your own plant search, and before you go to the nursery, check the trees that fit your needs the mostly closely. Make at least two trips to the nursery, because they will offer you a lot of things not on your list. Write down the scientific name (if they have it) and the common name of each plant offered, come home and do your research. Is it native? Is it native to your area? Will it fit in the space? Is it messy, invasive, have invasive roots, attract pests, is short-lived? And on and on. Then, go to our Step-by-Step Guide How to Plant a Tree. August 20, 2009 - My golden shrimp/lollipop plant has aphid like bugs. They are darker and firmer than aphids but clump like them. They are consuming it. What are they and how do I get rid of them? Why is non-native, invasive dandelion called a wildflower? B1 for transplant shock in non-native bamboo?